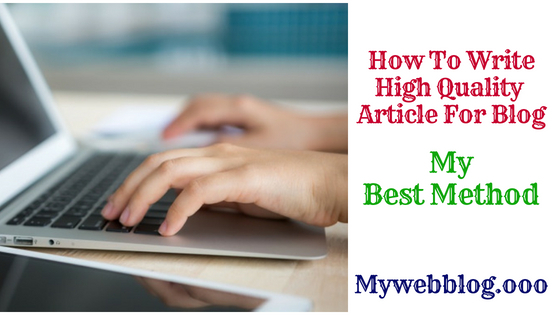 Write High-Quality Article For Blog - how to write high quality article if you want to make a career in blogging, then this is a topic that if you understand well then you will never be able to go to blogging. It comes in all the things that both Google and visitor like and both of them Is for very important. Quality matters everywhere. Should never compromise with quality. Quality work is much more than Quantity work. Work of a laborer is in Quantity. While his Supervisor does less work than him, his salary is more than the laborer. So Always go for Quality Work There are also 7 letters in Quality and 8 letters in Quantity. Despite having fewer letters, its quality is much higher. If you do any work in life then always focus on quality. But when it comes to blogging, always follow a standard. If you are a Blogger then you will know the demand of Valuable Post. There are two types of posts such as Trending which remains for some time in Search Engine and Social Media. The second remains always in Search Engine and Social Media. Number of Post is also important on Blog. But Number of Quality Post is more important than that. In the Blog Post 1000, 2000 Word Use does not come in quality. Search Engine has set a guideline of the Blog Post standard. Search Engine uses the Webmaster Tool to crawl the website. That's why Webmaster Guidelines follow. Google can also penalize your site if you do not follow the Webmaster Guideline. Before doing any work, you should collect the complete information about it. As we are talking about this post, High Quality Post is the most important thing to know, what is the high quality post, and what is the use of High Quality Post. What is H Q P: In a simple word, "So a post which reads both Reader and Searches Engine very well. The post should be SEO Friendly. The keyword should be used correctly. The post should be informative. The post should contain the correct information. Something in the content should be unique. Get Blog from Organic Traffic (The Google Webmaster who visits Google Search). This increases the credibility of the blog. From which Google starts ranking Blog in SERP and Alexa. Adsense CPC improves, thereby increasing the income. Public Figure of Admin is created. What is High Quality Post and what are its benefits? You have understood this very well. If you understand what and why these two words are very easy for you. You will definitely be familiar with Survey Word. Have you ever seen or heard the company's showroom open so Survey is running. When a person is just investing money, then it is invested only after doing Standard Survey. If you are Full-Time Blogger then you are investing your career. Whose price is many times more than the money invested. Therefore, research must be done before writing any post. The topic on which you want to write a post, how many people are reading. How much post is already available on the Internet? Looking at Adsense Advertisement, what is the cost per click on your selected topic? How much is your interest in the Selected Topic? After Topic Selection, Catchy Heading is essential. Write the blog post title as good as possible, the more clicks you have. Heading is something that has Eye Catching Power. When you see the User Heading, click on Post Link. Having Catchy of Heading will be Post User Friendly. SEO Friendly Heading means Search Engine Friendly Heading As Visitors Headings first look, then decide whether to click or not! Just like that, Search Engine also sets the Blog's status by looking at Heading. It means content written in an organized way. Do not write articles on the cow. Like "the cow is our mother. it's got four legs. It eats grass There are two eyes. Gives milk. The straw also eats There are two years. "It's not Standard Writing. Standard Writing means to clear all points one by one. Click on the Standard Writing Format to know details. By using Less Competition Topic, Blog will quickly rank in Google SERP. Your Competition in High Competition Keyword starts with the top level of Blogger and Company. Just look at the competition from Ambani is very tough. Therefore, first select Less Competition Topic. The long tail keyword is also a Keyword, it contains three or more words. There are some such things that the user searches together so that all behave like Word Keyword. Example - High-Quality Post Whenever you have to search for anything related to the good post, all three words will come together. Blog's ON PAGE SEO is very important for ranking Post in the Search Engine. Analyze your Post's On Page SEO from the SEO Web Page Analyzer. Click the link above or open this www.seowebpageanalyzer.com website. Paste the Post Link in the Search Box and click on Analyze Button on the Blog. From here you can check On Page SEO Score. Under these, all these points have to be paid attention. Check out how much your blog content is SEO Friendly. Does it need to be improved? In this post, I can only get it in the next post, but if you have any questions related to it, then you can comment.